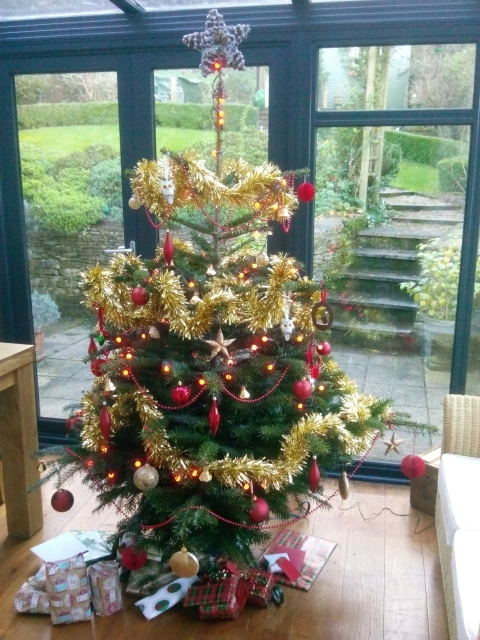 So there it was - another Christmas and New Year - this time spent in & around our home in the Cotswolds. The week before Christmas, my friend Penny came to visit - it was great to see her again after over 5 years! We have been planning a visit down to Cornwall, but somehow, since we've been back, we just haven't managed to fit one in. 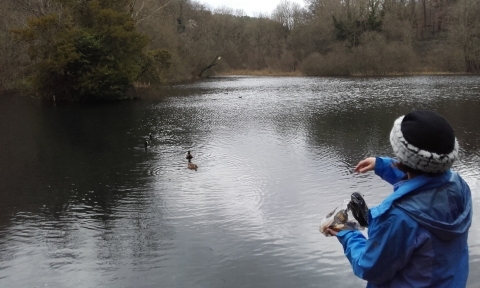 As the forecast was for dry weather, we planned a nice walk down to Cherington Lake. 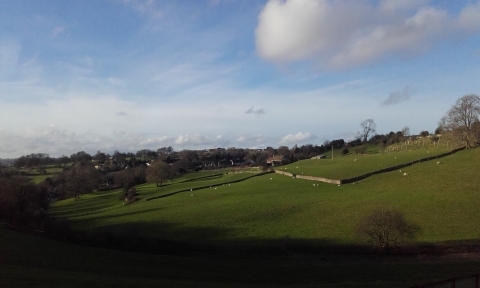 It would be a chance to show Penny one of the loveliest spots on one of our local walks. Penny's two springer spaniels Purdey & Bear would certainly appreciate the chance to stretch their legs too. It began to sprinkle with light rain as soon as we opened the front door but it looked like drying up as per the forecast, so off we set. The dogs seemed less than impressed when the rain got heavier, as was Andy as he didn't even have a coat. However, despite the squalls and hail we all managed to retain our sense of humour even though, by the time we returned to the cottage, we were all soaked through, even those of us with coats... After a quick change into dry clothes, sure enough it had stopped raining and we ambled down to the pub for lunch. Needless to say, halfway through lunch, we could see the sun breaking through the clouds and blue skies returning. Perhaps we should have had lunch before our stroll, but better luck next time, eh Penny? 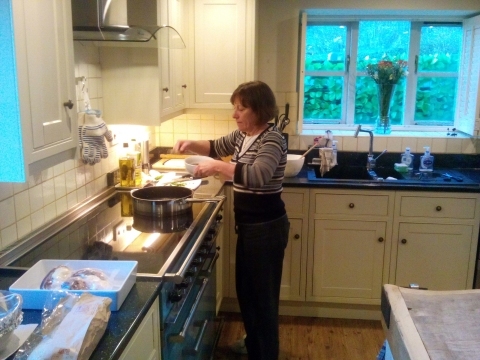 After fairly hectic preparations the week before Christmas, working and trying to plan our first Christmas back in the UK, we were both looking forward to over a week of combined relaxation, walking, cooking and feasting over the holiday. 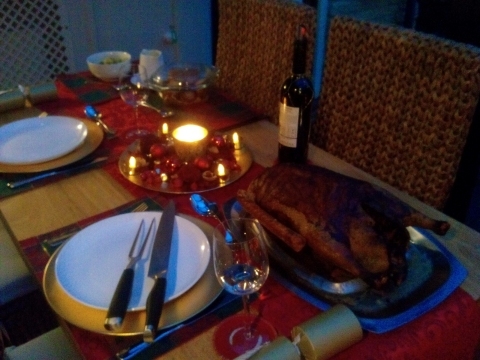 On Christmas Eve, we collected our goose and spent several relaxing and happy hours preparing for the next and subsequent days of festive feasting. 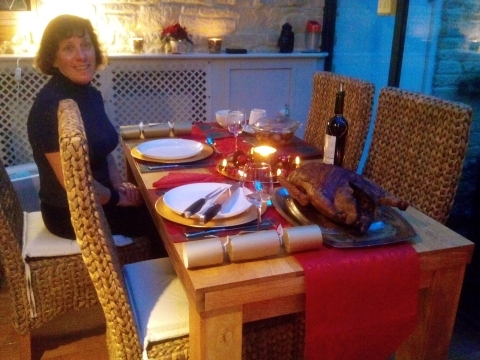 Having had turkey in various forms for the last five Christmases, we treated ourselves to a goose, and had no worries about oven space! 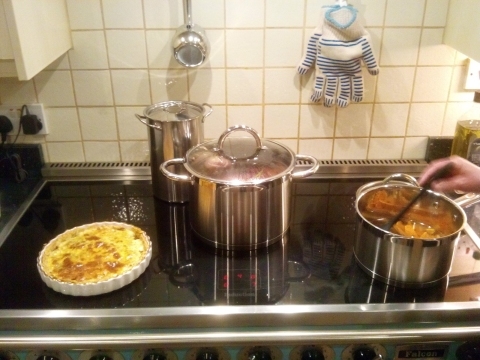 With a lovely range cooker and far more prep space than we had aboard Pipit, not to mention the big fridge/freezer, I was able to do some baking too, including some frangipane topped mince pies and goat's cheese and caramelised shallot tarts with walnut encrusted pastry. Gammon simmering, tart cooling and mulled wine mulling makes for two happy cooks. We had our traditional smoked salmon and scrambled eggs for Christmas breakfast - well brunch really as it was midday by the time we had stuffed our goose, put it in the oven and done enough of the other prep to enjoy a relaxed Buck's Fizz with our brunch, but what's the rush? Our lunch was delicious - so much so that neither of us had room for Christmas pudding or the cheese course, although we did just manage a warmed mince pie with brandy butter late in the evening! 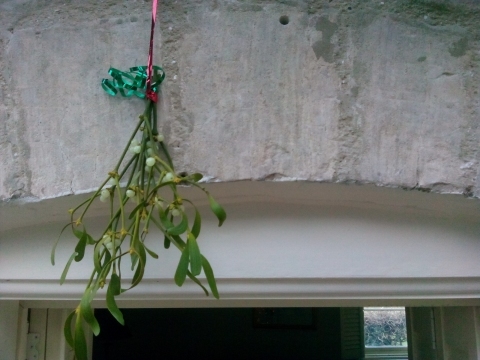 Can't really be Christmas without the mistletoe. 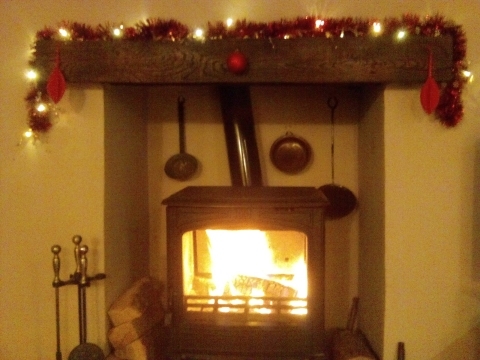 No chestnuts roasting, but a lovely roaring fire. After a few days of lazing about, often in front of a roaring fire, and catching up with various non-urgent chores and paperwork that somehow we haven't attended to for months, Tuesday's forecast looked like the best of the week with sunshine and blue skies until late afternoon so, walking boots on again and off on a 3 hour circular walk from our front door to Longfords Mill, Minchinhampton and Gatcombe Park. 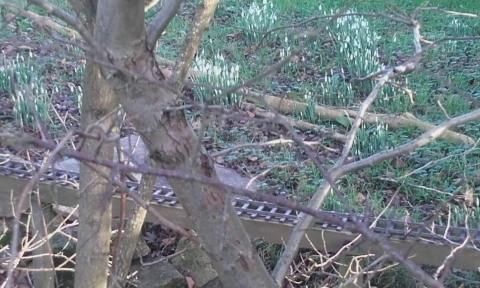 We spotted several small roe deer below Minchinhampton, buzzards wheeling overhead and a fantastic model railway running through a glade of snowdrops (the first we've seen this winter) at the bottom of a garden on the edge of Minchinhampton. Rather than going to the pub on New Year's Eve we decided to have a relaxing evening at home and cooked a couple of delicious local venison steaks, with cranberries and sloe gin sauce - well we do have plenty! New Year's Day itself was grey and drizzly, so we managed just a short walk which just happened to end at the pub... 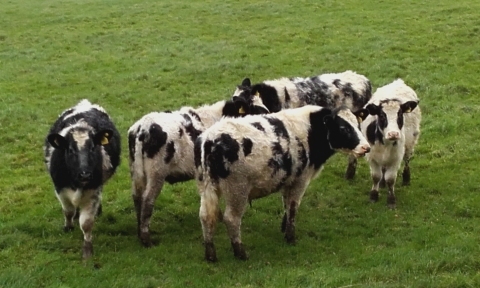 So to finish as we started, there it was - best wishes for 2016 to all our readers, both land-based and afloat!